OBJECTIVE To study the role of science related and other arguments in the development of workplace smoking regulations. SUBJECTS Written commentaries and hearing transcripts on proposed indoor air regulations in Maryland and Washington. MAIN OUTCOME MEASURES We coded each written commentary and hearing testimony for position toward the regulation, affiliation of the person submitting it, criteria used to evaluate science and scientific, ideological, economic, political, engineering and procedural arguments. RESULTS In both states, opposition to the regulations came primarily from the tobacco industry, small businesses, and business organisations and appeared to be coordinated. There was little coordination of public health support for the regulations. Arguments about science were used more often by those opposed to the regulations than by those in favour. Supporters emphasised the quantity of the evidence, while opponents criticised its reliability, validity, and quality. Arguments not related to science (61% of total arguments; 459/751), were more common than scientific arguments (39% of total arguments; 292/751). Economic and ideological arguments were used to a similar extent by regulation supporters and opponents. CONCLUSIONS Advocates can support health related regulations by submitting commentary emphasising the sound research base for regulation and countering criticisms of research. National coordination of these efforts could avoid duplication of effort and make more efficient use of limited public health resources. Smoking restrictions are an important component of tobacco control policy because they protect non-smokers from the adverse health effects of passive smoking1-5 and facilitate smokers' decisions to quit or cut down.6 Furthermore, individuals living and working in smoke-free environments are less likely to begin smoking than those who are exposed to smoke.7-10 The growing evidence on the adverse health effects of exposure to passive smoking has catalysed the development of workplace smoking restrictions. Of the 23 states in the USA that restrict smoking in private workplaces, two states (Maryland and Washington) do so through occupational safety and health regulations. 11 The remaining states have legislativerestrictions. Earlier studies of tobacco control policies have focused on the role of political factors including ideology and interest groups in influencinglegislation, 16-22 whereas this study examines regulations. Understanding regulatory as well as legislative policy development will be useful for advocates as they consider regulatory or legislative tobacco control strategies. The goal of this study is to analyse the role of public input and the public's use of scientific argument and evidence in the development of workplace smoking regulations. We conducted a content analysis of the written commentaries and oral testimony submitted in the two states. Prior research on the development of regulatory policies has found that consideration of the scientific evidence is influenced by politics and social movements.23-27 Therefore, we analysed the use of scientific, political, ideological, and economic arguments used by opponents and supporters of the regulations. By studying the relative roles of research and other factors in policy formation, we can suggest strategies to optimise the evidence base for legislation.28 We determine whether (1) the criteria used to judge scientific evidence, (2) the arguments about the quality of the scientific evidence, and (3) the types of non-scientific arguments about the regulation vary by support for the regulation. In late 1993, the Maryland Occupational Safety and Health Advisory Board (MOSH) proposed the Maryland Indoor Air regulation, banning smoking in almost all enclosed workplaces. The regulation was open to public comment from December 1993 to January 1994. Two hearings were held by the MOSH board in December 1993 and one by the Commissioner of Labor and Industry in May 1994.29 The regulation was approved on 21 July 1994, but later modified by the state legislature to exempt workers in the hospitality industry (restaurants and bars). Even with the exemption of the hospitality industry workers, the Maryland regulation covered more types of workers than the Washington regulation, which restricted smoking only in offices. In Washington, a series of incidents of “sick building syndrome” (respiratory and other illnesses associated with chemicals in indoor air) in government buildings, hospitals, and schools were reported to the Department of Labor and Industries during the early 1990s, and investigated by specialists from the University of Washington.30-34 In August 1992, the Washington Department of Labor and Industries produced a draft regulation on indoor air quality in offices. In November and December 1993, public commentary was collected and six hearings were held. In 1993, the Department of Labor and Industries drafted a comprehensive indoor air regulation aimed at protecting workers from a variety of indoor air contaminants, including environmental tobacco smoke. Based on strong opposition from the public to the indoor air components of the proposed regulation, the director of the Department of Labor and Industries narrowed the regulation to focus only on tobacco smoke exposure. This narrower regulation was approved on 16 March 1994. All written commentaries and hearing transcripts were obtained from the MOSH Department of Licensing and Regulation and Washington Department of Labor and Industries. We included substantive letters, reports, and the first copy of duplicate letters. We excluded non-substantive or illegible petitions, fact sheets, cover letters, postcards, electronic material (slides, videos), and handwritten submissions. In Maryland, 239 written commentaries and testimony from 119 individuals met the inclusion criteria. For Washington, we examined the 133 commentaries and 64 hearing testimonies that focused on passive smoking. We coded each written commentary and hearing testimony for position toward the regulation, affiliation of the person submitting it, and the arguments made. We developed coding categories inductively, based on initial data analysis, and in conjunction with categories used in previous, related research.35 Trained coders used a code book including decision rules. QSR-NUD*IST was used to facilitate data management and coding. We coded each commentary or hearing testimony as being in favour of the regulation, against the regulation, or neutral (for example, pointing out typographical errors) toward the regulation. Neutral commentaries (n = 17) were excluded from further analysis. The coders read each entire written commentary and hearing transcript and coded sections of text for the arguments made. A single text unit could be coded for multiple occurrences of an argument. We report the number of times that an argument occurredat least once in a written commentary or hearing testimony. The coding scheme had two components: (1) criteria used to evaluate science and scientific arguments; and (2) economic, ideological, political, and other arguments. For the purposes of this article, a “scientific” argument is defined as an argument that relied on research evidence, including, for example, basic science, epidemiology, engineering, or economic research. We did a content analysis to compile descriptive statistics that allowed us to detect patterns of position on regulation, affiliation or type of argument made.37 We analysed the states separately because we expected variation that could be attributed to scope of the regulation (all workplaces v offices), distinct historical genesis of the regulation (accidentv “sick buildings”), and to geography (Eastern tobacco producing state v Pacific Northwest state).23 We compared the extent and types of arguments and counter arguments used by supporters and opponents of regulation. The χ2 statistic or Fisher's exact test, as appropriate, was used to test for differences in affiliations and proportions of arguments used between commentary in support of the regulation and commentary against. As shown in table 1, those in favour of the regulation submitted more written commentary or testified at hearings more than those who were opposed to regulation. The distribution of affiliations differed between supporters and opponents of regulation. Those in support of the regulation were more likely than those against to represent lay activist associations (such as Action on Smoking or Health), health professionals, or government employees (table 1). Overall, about one quarter of the opposition to the regulation came directly from the tobacco industry. There was some duplication between the tobacco industry affiliated commentaries in Washington and Maryland. For example, Philip Morris submitted over 40 binders (15 429 pages) of duplicate material to Maryland and Washington. With just one exception,† the tobacco industry unanimously opposed the regulations. The remainder of the opposition was primarily from small business owners, business organisations, and labour organisations. Overall, more arguments were made in support of regulation (n = 454) than in opposition (n = 297). Arguments not related to science, particularly economic, ideological, political, and procedural arguments (61% of total arguments; 459/751), were more likely to appear in commentary and hearings than scientific arguments (39% of total arguments; 292/751). “Regulator: Just to make sure I'm clear, are the two papers you referred to on the absence of nicotine and research related to tobacco smoke, are they part of the record?Engineer: No, but I can certainly make them part of the record.Regulator: Have they been through peer review?Engineer: Oh, yes. Regulator: I would like any documentation on what peer review they went through. Most of the commentaries and testimony that discussed the quality of the evidence also gave detailed critiques of the research methods. 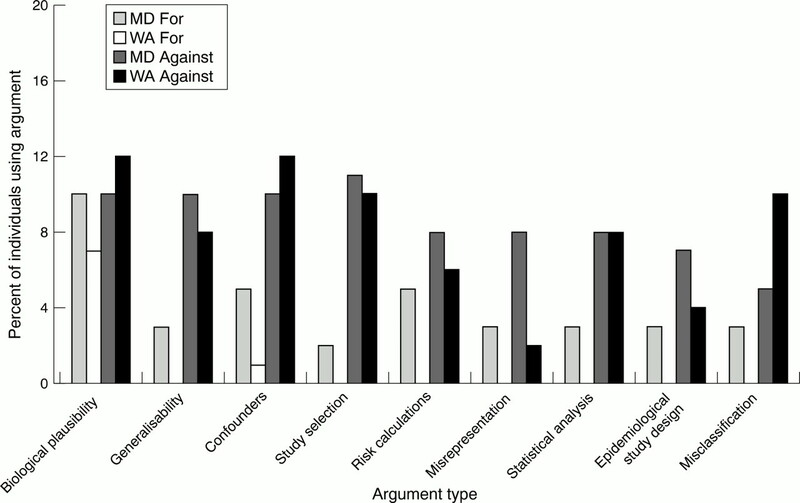 Figure 1 shows that opponents of regulation were more likely to use scientific arguments than supporters. This difference was significant in Washington (p = 0.0002, χ2), but not Maryland (p = 0.8197, χ2). Scientific arguments. MD, Maryland; WA, Washington. A common strategy of opponents of regulation was to focus on a single aspect of a study, rather than the study as a whole. Opponents of regulation often criticised the methods of studies on the health effects of passive smoking based on their generalisability, inability to control for confounding factors, selection of studies included in literature reviews, and misclassification bias (fig 1). Although there are strong methodological rebuttals of each of the scientific arguments against the regulations,38 commentaries in favour of the regulation rarely contained arguments about the science (fig 1). In Washington, for example, those in favour of regulation used only the arguments about confounding and biological plausibility. 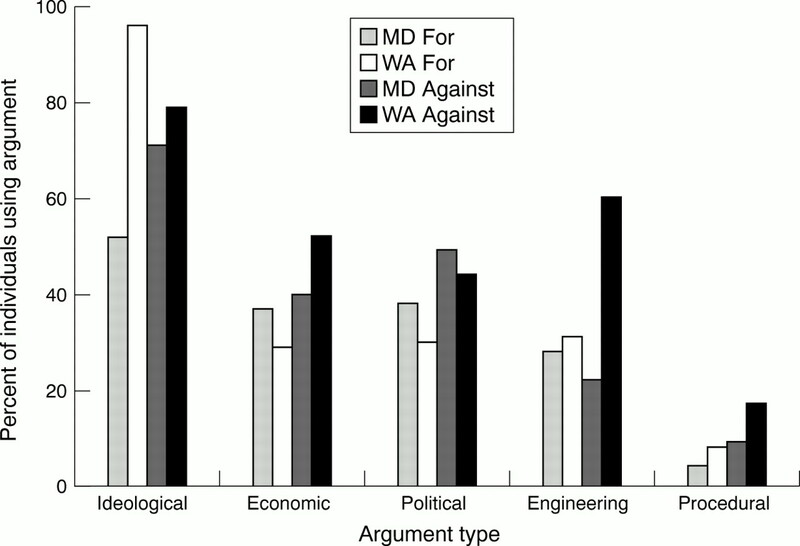 As shown in fig 2, political, engineering, and procedural arguments were used more frequently by regulation opponents than supporters. Ideological and economic arguments were used to a similar extent by both supporters and opponents. Procedural and political arguments were used more often by opponents of regulation than supporters (fig 2). A consistent theme among these arguments was challenging the legitimacy and the authority of the administrative board to regulate exposure to tobacco smoke in the workplace. Other opponents asserted that restricting smoking in the workplace should be legislated not regulated. Still others asked the board to wait for the federal Occupational Safety and Health Administration (OSHA) to promulgate its indoor air regulation before acting. This witness is testifying that, in effect, a tornado would need to be created in the room in order to reduce passive smoke to a level that is not harmful. Although the regulatory process requires that scientific evidence be considered when developing a regulation,14 economic, political, and ideological arguments were more likely to appear in commentary and hearings than scientific arguments. This finding confirms trends observed in the analysis of legislative tobacco control policy.18 Economic and ideological arguments were used to a similar extent by regulation supporters and opponents. Although scientific arguments were used less frequently than other types, arguments about the science were used more often by those opposed to the regulations than by those in favour. In both states, those opposed to the regulations attempted to reduce regulators' confidence in the research evidence upon which the regulations were based. The criteria used to evaluate the evidence base for the regulation differed between those opposing or favouring the regulation. Supporters emphasised the quantity of the scientific evidence, while opponents criticised its reliability, quality, and validity. Numerous scientific studies regarding the health effects of passive smoking and the economic impact of smoking restrictions exist. However, those in favour of the regulation often failed to mention these studies in order to counter the criticisms of the science. Those favouring regulation may have believed that the scientific evidence supporting the workplace health restriction was well accepted and that there was no need to restate the evidence. Tobacco industry emphasis on the science is most likely due to two factors: one historical, the other strategic. The tobacco industry, like other corporations that are subject to regulation, has used a number of tactics to prevent regulation of their product.41-43 For years, the industry has funded and published research that supports alternative explanations for the adverse health effects associated with passive smoking, as well as criticised research that finds an association of passive smoking and adverse health effects.36 44-47 We have shown previously that original research articles from symposia proceedings, such as those cited in the public commentary by the tobacco industry, use different standards for peer review and are of poorer methodological quality than articles from peer reviewed journals.48-50Our findings suggest that the industry has used some of their funded critiques to undermine the science that underlies regulation of passive smoke and infuse the development of tobacco control regulations with controversy.51 When these two regulatory efforts were launched almost simultaneously in the two states, the tobacco industry was able to produce volumes of written commentary critiquing the science that underlies workplace smoking restrictions and send their paid scientific advisors to hearings. Our findings suggest strategies for supporting health related regulations. Firstly, supporters of regulations could keep the issue framed as a scientific one by submitting commentary that emphasises the sound research base for the regulation. Secondly, supporters of regulation could counter the criticisms of the research on which the evidence is based. Lastly, organisation of these efforts to support regulation at a national level, rather than a local level, could avoid duplication of effort and make more efficient use of limited public health resources. Smoking restrictions can be promulgated through legislation or regulation. Earlier studies have focused on the role of political factors including ideology and interest groups in influencing legislation. In this study, we focus on the development of smoking restriction regulations and analyse the role of public input and the public's use of evidence in regulation development. Arguments about science and how science should be evaluated play a role in regulation development. Economic and ideological arguments also appear frequently in discussions of regulation. Advocates can support health related regulations by submitting commentary emphasising the sound research base for regulation and countering criticisms of research. We thank Marieka Schotland, Theo Tsoukalis, Ruth Malone, and Elizabeth Boyd for useful comments on the manuscript, and Peter Bachetti for statistical advice. This work was supported by grants from the American Cancer Society (RPG9714301PBP) and the University of California Tobacco-Related Disease Research Program (6RT0025). (1991) Passive smoking and heart disease: epidemiology, physiology and biochemistry. Circulation 83:1–12. (1992) Respiratory health effects of passive smoking: lung cancer and other disorders. (Indoor Air Division, Office of Atmospheric and Indoor Air Programs, Office of Air and Radiation, United States Environmental Protection Agency, Washington, DC). (1986) The health consequences of involuntary smoking. A report of the Surgeon General, 1986. (Public Health Service, Centers for Disease Control, Rockville, Maryland) . (DHHS Publication No (CDC) 87-8398.). (1986) Environmental tobacco smoke: measuring exposures and assessing health effects. (National Academy Press, Washington DC). (1995) Workplace smoking policy and changes in smking behaviour in California: a suggested association. Tobacco Control 4:36–41. (1998) Has the California tobacco control program reduced smoking. JAMA 280:893–899. (2000) Effect of restrictions on smoking at home, at school, and in public places on teenage smoking: cross sectional study [see comments]. BMJ 321:333–337. (2000) Association between household and workplace smoking restrictions and adolescent smoking. JAMA 284:717–722. , ed (1998) State legislated actions on tobacco issues. (American Lung Association, Washington DC). (1997) The limits of social learning: translating analysis into action. J Health Politics, Policy and Law 22:1077–1114. (1999) Legal alchemy: the use and misuse of science in the law. (WH Freeman and Company, New York). (1998) Regulation. in International encyclopedia of public policy and administration. ed Shafritz JM (Westview Press, Boulder), pp 1943–1948. (1996) Regulatory reform proposals and public health [editorial]. Environ Health Perspect 104:356–361. (1998) Are tobacco industry campaign contributions influencing state legislative behavior? Am J Public Health 88:918–923. (1993) The politics of anti-smoking legislation: lessons from six states. J Health Politics Policy Law 18:787–819. (1997) Historical overview of tobacco legislation and regulation. Journal of Social Issues 53:75–95. (1994) Tobacco industry campaign contributions are affecting tobacco control policy making in California. JAMA 272:1176–1182. (1997) State legislators' perceptions of lobbyists and lobbying on tobacco control issues. Tobacco Control 6:332–336. (2000) Political ideology and tobacco control. Tobacco Control 9:263–267. (1997) State legislators' attitudes and voting intentions about tobacco control legislation. Am J Public Health 87:1197–1200. (1999) Social movements as catalysts for policy change: the case of smoking and guns. J Health Politics Policy and Law 24:421–488. (1987) EPA's regulation of daminozide: unscrambling the messages of risk. Science, Technology, & Human Values 12(3 & 4):116–124. (1998) The costs of cigarettes: the economic case for ex post incentive-based regulation. Yale Law Journal 107:1163–1262. (1999) Litigation and public health policy making: the case of tobacco control. J Health Politics Policy and Law 24:769–804. (1989) Bureaucracy: what government agencies do and why they do it. (Johns Hopkins University Press, Baltimore, Maryland). (1997) Evidence-base healthcare: how to make health policy and management decisions. (Churchill Livingstone, New York). (1994) Decision of Commissioner of Labor and Industry on proposed regulation to prohibit smoking in enclosed workplaces. Maryland Register 21:1336–1352. Lange L. What makes buildings sick: chemicals in stale air blamed for many workplace maladies. Seattle Post-Intelligencer 5 March 1990;A1..
Bock P. District can't cure pollution problem in ‘sick’ school. The Seattle Times 7 February 1991;C3..
Bock P. City likely stuck with bill for sick school—Pupils breathe easier after revisions at Hay Elementary.The Seattle Times 17 April 1992;B1..
Taylor R. Operators blame Harborview for illnesses; Improvements made to ‘sick building,’ but complaints continue.Seattle Post-Intelligencer 26 December 1991;B1..
Williams H. ‘Sick Buildings’ vex office workers but elude regulation. The Seattle Times 26 September 1990;H1..
(1993) Tobacco industry response to a risk assessment of environmental tobacco smoke. Tobacco Control 2:103–113. (1993) Qualitative content analysis: a guide to paths not taken. Qualitative Health Research 3:112–121. (1992) Issues and answers concerning passive smoking in the workplace: rebutting tobacco industry arguments. Tobacco Control 1:208–219. (2001) Policy makers' perspectives on public health advocates' roles in regulation development. Tobacco Control 10:218–224. (2000) Lessons learned from the tobacco industry's efforts to prevent the passage of a workplace smoking regulation. Am J Public Health 90:1926–1930. (1991) The silence: the asbestos industry and early occupational cancer research—a case study. Am J Public Health 81:791–800. (1985) A ‘Gift of God’? : the public health controversy over leaded gasoline during the 1920s. Am J Public Health 75:344–352. (1999) Lead poisoning research and public health policy in the United States (1924-1987): an analysis of institutional failure. Research in Social Problems and Public Policy 7:83–103. (1996) Industry-funded research and conflict of interest: an analysis of research sponsored by the tobacco industry through the Center for Indoor Air Research. J Health Politics, Policy and Law 21:515–542. (1995) Lawyer control of the tobacco industry's external research program: The Brown and Williamson documents. JAMA 274:241–247. (1995) Lawyer control of internal scientific research to protect against products liability lawsuits: the Brown and Williamson documents. JAMA 274:234–240. (1997) Scientific quality of original research articles on environmental tobacco smoke. Tobacco Control 6:19–26. (1992) The publication of sponsored symposiums in medical journals. New Engl J Med 327:1135–1140. (1996) The quality of drug articles published in symposium proceedings. Ann Intern Med 124:485–489. (1999) Print media coverage of research on passive smoking [see comments]. Tobacco Control 8:254–260. (2001) Affiliation bias and expert disagreement in framing the nicotine addiction debate. Science, Technology, & Human Values 26:278–299. (2001) Organochlorines and breast cancer: the use of scientific evidence in claimsmaking. Soc Sci Med 52:1589–1605. (1994) Breaking the habit: attentive publics and tobacco regulation. in How Ottawa spends 1994-95: making change. ed Phillips S (Carleton University Press, Ottawa). (2000) Science on stage : expert advice as public drama. (Stanford University Press, Stanford, California). Americans for Nonsmokers'Rights. URL:, 2001. http://www.no-smoke.org/. Action on Smoking and Health (ASH) URL: . 2001. http://ash.org/.